The Ghost Photographer takes the reader along on Julie Rieger’s cosmic course of self-discovery. Her journey of is not always an easy choice, but she jumps in with both feet willing to take the ride wherever it takes her. But her newly found psychic powers allow her to be at peace with herself and others. Isn’t that about all anyone can ask for? Julie is often bawdy, funny and willing to share both the good and bad parts of her life with her readers. She explores the reason for her grief, but realizes grief comes to others in different forms that are just as devastating as the loss of her mother was to her. She knows she needs to dig deeper to figure out the person she will be now that she is really on her own for the first time in her life. Her journey begins when she discovers pictures of ghosts in photographs she has taken. (The pictures are included at the end of the book for you to decide for yourself). She works to develop her psychic gifts with close friends who have clairvoyant abilities. She also references famous people who were prophetic, second-sighted and/or were precognitive. They include Mark Twain, Abraham Lincoln and Winston Churchill to name a few. The thing that may surprise readers about Julie is her reliance on religion throughout her journey. She repeats how often she uses the power of prayer to protect herself and others from evil spirits. It should not surprise us that good and evil go hand in hand, and protecting yourself with a higher power is often necessary when delving into the unknown. There are a few things that might give you goose bumps. The chapter about “Old Scratch”, whom the Bible says is a stand in for the devil, is pretty creepy. This is a very interesting, funny and thought provoking book. It is fast to read and full of things that you may or may not believe could ever happen. If so, take it at face value for your entertainment. That is okay, it is Julie’s journey to document and share. If you are a fan of Eat, Pray, Love by Elizabeth Gilbert or Wild: From Lost to Found on the Pacific Crest Trail by Sheryl Strayed you need to read this book. Journey and self-discovery comes to different people in different ways, each of them unique and interesting to read about. DISCLOSURE OF MATERIAL CONNECTION: I have a material connection because I received a review copy for free from Netgalley, Killer Nashville and Atria Books in exchange for a fair and honest review. 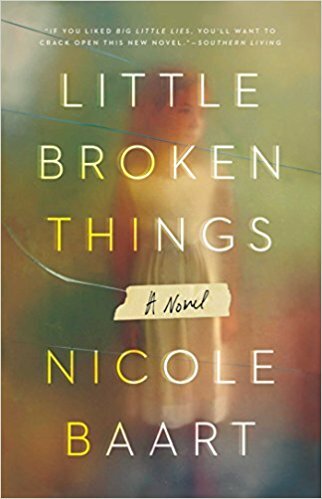 Little Broken Things begins with Nora Sanford cutting and dying the hair of a child she obviously loves, but is not hers. There is a sense of danger and impending disaster if she doesn’t change the little girl’s appearance and move her to a safe place before the unknown disaster befalls both of them. Nora whisks her off and dumps her unceremoniously at her sister Quinn’s home. Without a clue as to who the child is, or why Nora drops her off without any explanation, Quinn is angry at her sister but fearful because Nora begged her not to let the child out of her sight. And more importantly, she was not to let anyone know the child was there. That is more than difficult because Quinn’s artist husband is living in the house with her. Her domineering mother, Liz, owns the house and lives right across the lake from them in the home that Nora, Quinn and their brother JJ grew up in. How can she keep a five year old secret in this little town of gossips? As the plot swirls around the little girl, with eminent danger closing in, there are no straight answers about her or her parents available to those who were given the impossible task of keeping her safe. Nora has brought this to her family’s doorstep, but this is not the only secret her family has been pretending isn’t there. On the outside they were a solid, happy family but even as young children, the three Sandford kids knew how to keep secrets. Such as the happy family life they portrayed was often far from it. Even after the recent death of her husband, Liz followed the Sandford “rules” put in place by her domineering husband that often affected her children even though they are grown. They must find a way to work together to save this child no matter who she really is, even if it goes against everything they have been taught to do. 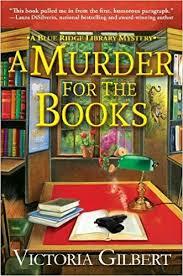 Baart brings so many elements in to bring her characters to life I felt as though I knew each of them. There were several things that brought them together. Art plays a huge but subtle part in the storyline. Motherhood also plays a huge role in Little Broken Things. I really enjoyed Little Broken Things. 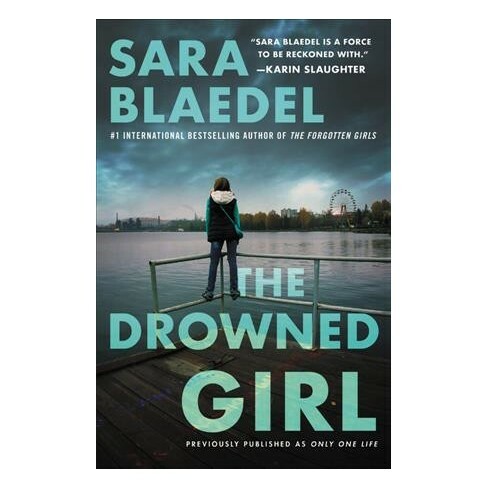 It is smart, suspenseful, heartbreaking and written so well I was holding my breath praying for the safety of the little girl at the heart of the mystery. When an author can make me care that much for the characters she has created I know she will deeply touch the hearts of all of her readers. This is the first book I have read by Nicole Baart, but it will not be the last. Sophie is a woman in conflict. At the very least she is mentally unstable, but she is quite possibly a murderer. Somehow she goes from being a happily married career woman to a fugitive in the blink of an eye and she cannot understand how the whole thing happened to her. It starts with little things. Missing items, forgetting to do small errands, lost birthday gifts that turn up months later. These lead up to horrible mistakes at work. Soon Sophie begins to lose more than everyday items; she is also missing parts of her day. She finds herself in places and situations and doesn’t have a clue as to how or why she is there. Her husband is losing his patience and she is sure she has lost her mind. Each slip of memory chips a sliver of her psyche away until she doesn’t know who she is anymore. It isn’t hard to disappear and reinvent herself when it became necessary, she does what she has to do. What is hard is finding a new husband whose name she can take to solidify her new persona. But she has always known somewhere inside herself there is a strong, smart woman behind the façade she has built to hide behind. But is there enough of that woman left to save her? Enter Frantz, the shy military man Sophie meets through a dating service. Frantz wants to help Sophie and she is so exhausted all of the time she is relieved to find someone she can trust to take care of her. Even if she doesn’t really love him, she needs him. He just might be her ticket out of the crazy life hers has become – or is she jumping from the frying pan into the fire by making a pact with the devil himself? A catalyst, unbeknown and barely associated to Sophie, sets off a series of life changing events. The scariest thing is that any or all of the things that happen to her could happen to anyone if they are in the wrong place at the right time. It is terrifying to realize how easily Sophie’s life turned upside down and out of control. 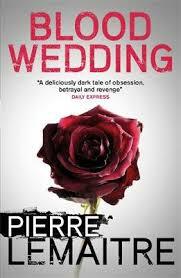 If you look up Suspenseful Thriller Blood Wedding should be at the top of the list. I could not turn the pages fast enough to see what happened next. The plot is so solid I could not find an unanswered question. 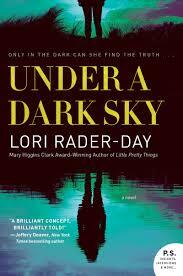 The supporting characters have depth and are memorable without overshadowing but always important to the story. Their interaction with the main characters enhanced and advanced the plot. The main characters are fully developed, multi-dimensional and seem to jump off the page to grab the reader’s attention. Sophie pulls you into her descent into madness, from which I fervently hoped she would be able to claw her way back to the person she used to be. Nothing or no one is what or who they seem to be as the plot swirls around Sophie and Frantz. LeMaitre expertly grabs the reader, dragging you into the depth of Sophie’s despair and into the plotting mind of Frantz. Then he takes you on a roller coaster ride through a house of mirrors at breakneck speed, making you question the ideas you had when you met Sophie and Frantz. This adventure is one that readers live for. You will not be disappointed. From the first page to the last the suspense never stops. I love this book. The lightning fast pace, perfect plot and characters that are unerringly realistic are reminiscent of a Hitchcock movie. Each page helps build the tension until the momentum explodes in the final chapters. The ending is satisfying, with no loose ends begging for explanation, which is perfection. Pierre LeMaitre is an acclaimed, award winning author and screenwriter. His books are written in French, but many have been translated to English. Blood Wedding is the first novel I’ve read by LeMaitre, but it will not be the last.